Senator Dino Melaye (APC-Kogi West) has explained why he opted to sit among opposition senators shortly after he resumed sitting following weeks of absence. 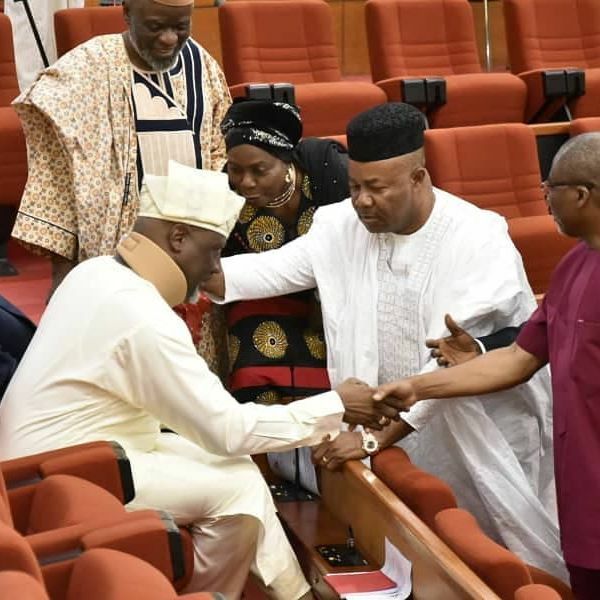 The senator opted for a change of seat to the side occupied by senators from the People’s Democratic Party (PDP) on Wednesday. “I see lion, tiger and snakes on this sit. Change my sit,” Maleye said in a message posted on his Instagram page. The embattled senator had been away from the plenary for some weeks after he sustained injuries when he allegedly jumped off a police vehicle when he was being take to a court for an appearance in a criminal case. A PDP senator, Ben Murray-Bruce, subsequently ‘welcomed’ him to the party on Twitter. “Hearty welcome to our great party, @OfficialPDPNig. We will treat you good – no trauma or intimidation whatsoever,” Murray-Bruce tweeted. However, Senator Melaye has not made any official declaration about his decamping to the People’s Democratic Party (PDP).